This week, President Obama and Interior Secretary Salazar returned to familiar territory, once again chastising energy companies for maintaining an inventory of undrilled Federal leases. WASHINGTON – The White House on Tuesday pushed back against the oil and gas industry’s claims that the Obama administration is blocking domestic energy development, releasing a new analysis showing that 46 million acres of federal lands and waters leased for drilling are sitting idle. So shut up and drill the leases you already have! In this post I will try to demonstrate just how disingenuous that position is. Wood-Mackenzie Oil and Gas Map of the Gulf of Mexico (€675). 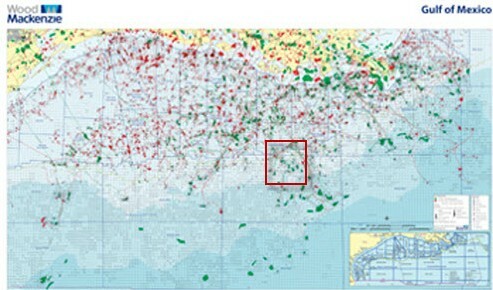 The red splotches are gas fields and the green blobs are oil fields. Pipelines are shown as lines. Now, it’s hard to make any sense of the Gulf-wide map above, so let’s consider a detail, roughly the area in the red box (each block on this map measures roughly 3 miles by 3 miles): Lo and behold, all acres were not created equal. 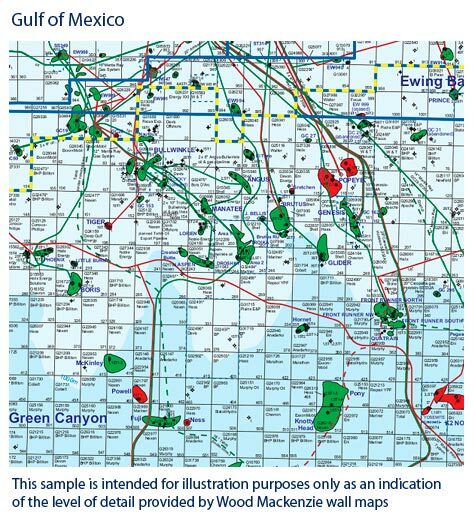 Oil and gas in the Gulf of Mexico province do not occur everywhere, but only where there is a serendipitous confluence of geologic factors: favorable structures, permeable rocks and some kind of trap to keep the oil or gas from escaping. Most of the prominent and promising geologic features have already been drilled.The structural framework of the Gulf of Mexico is fairly well understood. Future drilling may find new fields in between the ones that have already been found, but in general they are deeper, less prominent, and more risky than the ones discovered earlier. Something like 90% of the area is non-productive. If you blindly throw a dart at the map, 9 out of 10 times you will not strike oil or gas. Explorationists use highly detailed seismic surveys to gain a precise structural understanding of a prospective area. A 200 foot error in placement of a well could mean the difference between a discovery and a dry hole. Given the current low market prices for natural gas, few operators are looking for gas prospects. That further limits the area which is prospective for oil, but many of those blocks containing gas prospects are already under lease. Those leases were entered into by the operator when the price of gas was much higher, but they are no longer economically attractive. 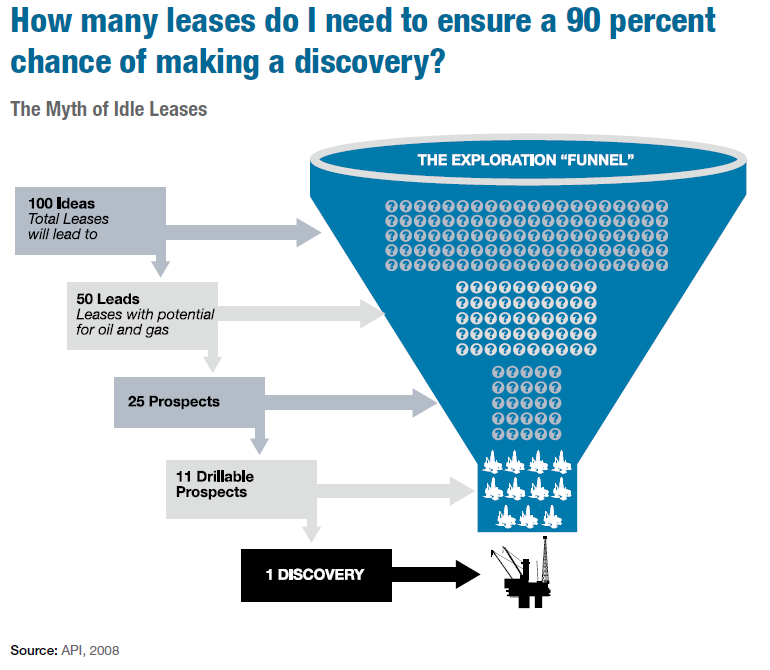 They still count against the “undrilled leases” statistic. Surely Messrs. Obama and Salazar are intelligent men. They are capable of understanding the information contained in this simple blog post. Moreover, many of the undrilled lease blocks that they complain about have been leased multiple times in the past. Because it has been intensely drilled, we can make a reasonable good educated guess of how much oil and gas remain. What we don’t have a very good feel for is how much oil and gas there is on the 85% of the Outer Continental Shelf that President Obama and Secretary Salazar have no plans of opening for leasing. Until the day comes that those areas are opened for exploration and drilling actually occurs, we will have no way of knowing their true potential.